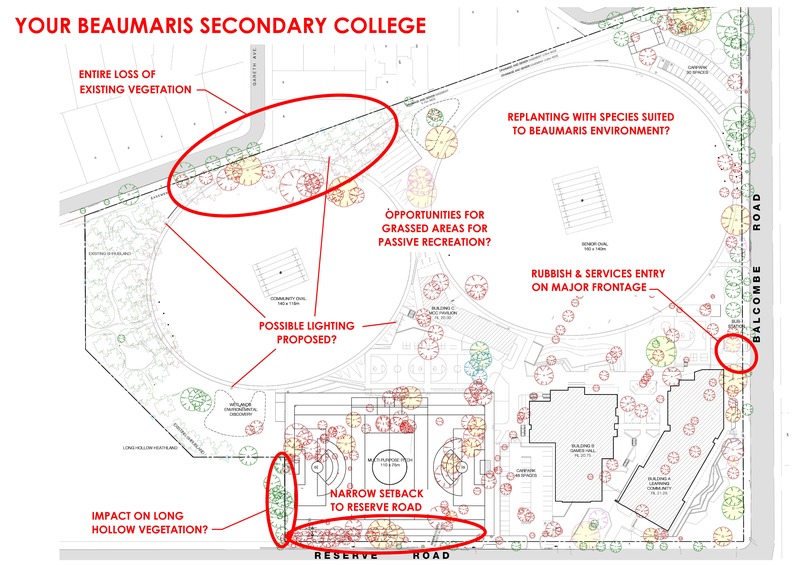 Finally the community consultation and ‘collaborative approach’ lauded by the VSBA for the design of the new Beaumaris Secondary College is taking shape. This Friday 25.11.16 (5.30 – 7.30pm) is a Community Information Session at the Beaumaris Library. A ‘two hour Community Information session to find out more about our new Beaumaris Secondary College and how it will benefit the whole community’. Beaumaris. This is your chance to be heard. This is your new school, for your children. Only this week, the VSBA has made moves to suggest retention of additional trees. That is a positive and should be acknowledged. Probably the most significant tree on the site, a 200-year-old River Red Gum, along with another significant Eucalypt have both been proposed for retention either side of the main oval. These trees will form a majestic backdrop to the playing fields. More trees to the centre of the school should hopefully be retained and the car parks have been redesigned to accommodate existing trees. This is a good move forward. Improvements can still be made. Major concerns are still around the removal of the entire stretch of Tea-tree and heathland along the Gareth Avenue Boundary. What is shown as existing vegetation to be retained to the rear of the proposed practice nets is, in fact, incorrect and will result in total removal. The Community Oval is still very close to Gareth Avenue, which will not allow for meaningful, or practical, buffer planting. There is the suggestion of lighting to the Community Oval, which appears unnecessary and could have significant impact on neighbouring properties. The synthetic sports field is very close to Reserve Road, which again will prevent significant buffer planting. There has been no detail given to what excavation works or retaining walls will be located on the southern end of the synthetic field, and what impact that will have on the root zones of trees immediately adjacent in Long Hollow Heathland. The rubbish bin and service entrance of Balcombe Road is a poor frontage for the school on the main thoroughfare through Beaumaris. The plans currently show that apart from the ovals, the open space areas are predominantly hard surfaces and pavement. What opportunities will students have to enjoy grassed open space areas for non-active recreation? The existing planting plan features many exotic and unsuitable plants for Beaumaris. These and other concerns can be raised on Friday. Now is your chance to be heard. Regardless of your opinions on the value of tree retention, this is your chance to ask questions of the design and to determine whether this is the best possible outcome for your school. But will the VSBA be listening? Unfortunately, with the project already out to tender, it seems very late to be seriously taking on the community feedback. At a recent meeting with the Director of Major Projects, we were the VSBA were celebrating that consultation was occurring. What actually happened was they came to the meeting with the plan and told us it wasn’t going to change. So let’s aim for better consultation with the community this Friday. Beaumaris, this is your chance to have a say. Your chance to take the time to look at the detail of the design and consider how this affects you and your family. As a design professional, I still find significant issues with the design and this is the result of a very poor design process to date. That is in the past, however. Reading court next to basketball court, unreachable bookshelves on a stair thoroughfare, gathering space in the middle of an open multi-storey building, yes many design concerns but they’re not showing us much. Good points Stuart. I haven’t even looked at the building design as I have been focusing on the landscape. Did you get a chance to raise these items at the meeting? VSBA multi storey government schools acoustics and climate control are typically terrible. Good bang for buck visually but teaching and learning suffers with excessive background noise and extreme temperatures common. Never trust an architect for an effective school that in practice feels good. I think that architects are definitely the best to be designing schools, however they need to do their research and invest in proper consultation with all stakeholders as part of the design process. There has been a clear disconnect in the process with the Beaumaris High School. Unfortunately that has occurred, but is now in the past. Hopefully now the VSBA and architects can take on board the feedback from Friday and make improvements to the design before it is too late. Agree all new gov school buildings hot/cold & NOISY. Low budget attempts to get enrolments look good but acoustics/insulation puts money into things you don’t see and are then hard to work in. Bayside gov schools should check out Star of the Sea for a lesson in learning environments.